What does success look like? It’s easy enough to outline the attributes of a great ad on LinkedIn, but nothing paints a clearer picture than an actual example of a campaign that drove outstanding real-life results. Well, we aren’t going to give you an actual example. Instead, we’re going to give you 10 awesome LinkedIn ad examples. In each case, you will be able to extract strategies and best practices for maximizing your impact on the world’s largest professional network. 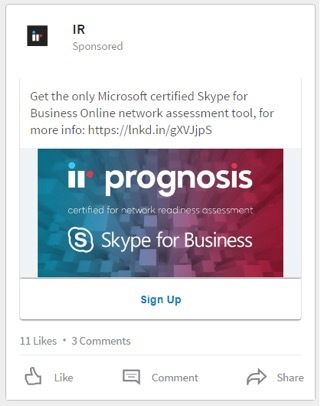 Utilizing the different types of LinkedIn ad formats in creative and often unique ways, these businesses received demonstrable boosts from the platform’s powerful promotional tools. Read on, and gain insights on how you can do the same. Living in the digital world and counting marketers among its highest-value audience segment, Adobe faces stiff competition when it comes to gaining attention share. Luckily, LinkedIn’s membership includes a bevy of individuals in Adobe’s wheelhouse, and the software company was able to reach many of them with a targeted Sponsored Content campaign highlighting research, infographics, and entertaining videos. Post-campaign measurements showed distinct improvements in Adobe’s reputation as a thought leader and media optimizer. Learn more. 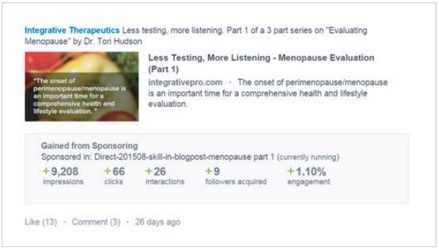 Recommended: Check out our gallery of top LinkedIn Sponsored Content examples. 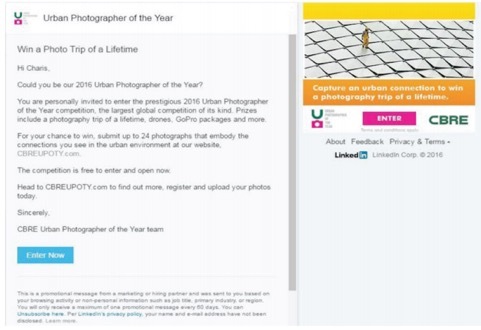 As a B2B commercial real estate company, CBRE was already running successful ad campaigns on LinkedIn but wanted to take a more consumer-centric approach with its Urban Photographer of the Year competition. By taking advantage of the network’s precision targeting filters, CBRE homed in on shutterbugs and pro photographers with eye-catching Sponsored InMails and yielded direct, one-on-one conversations that proved fruitful. The campaign scored big open and click-through rates, with contest entries increasing by 41 percent over the previous year. Learn more. Graduate programs are always seeking out the highest caliber of candidates, but finding and engaging them isn’t always easy. 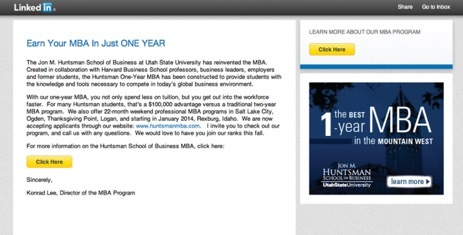 By tapping into LinkedIn’s unparalleled demographic data, Utah State University was able to set targeting parameters around geography, expertise, and career level to reach a tremendously valuable subset through Display Ads and Sponsored InMail. The relevance resonated, as the campaign drove 20-to-1 ROI and converted more than 70 percent of clicks into requests for information. Learn more. Australian software company IR was enjoying steady results with its Sponsored Content campaigns, but really kicked things up a notch by making its landing pages more mobile-friendly and implementing LinkedIn Lead Gen Forms. 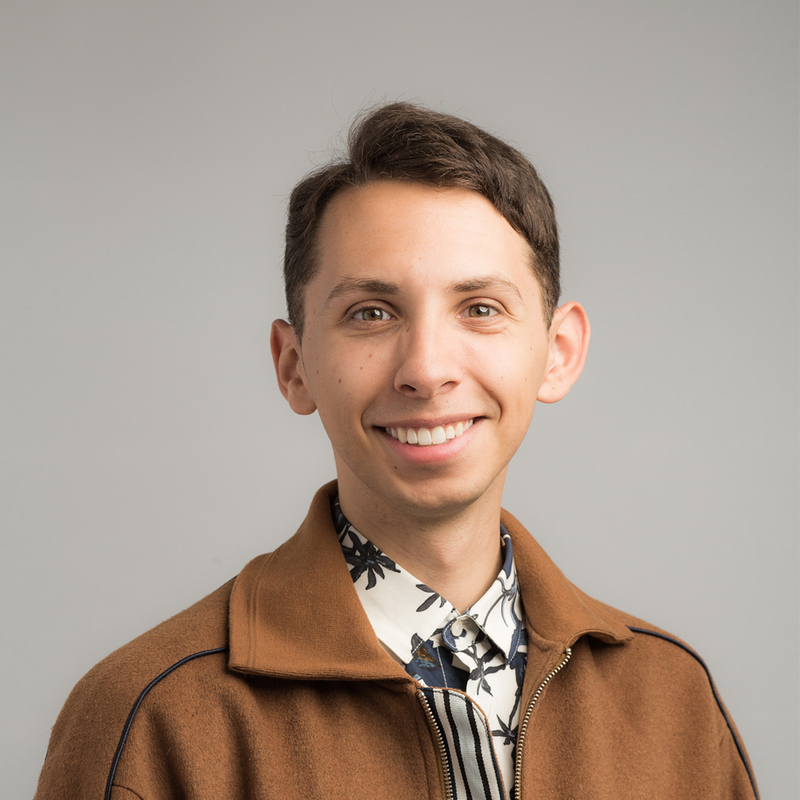 The latter solution enables marketers to set up pre-filled forms for seamless data collection without forcing users to navigate away from LinkedIn, and IR found that these forms immediately converted at the same rate as landing pages they’d spent more than a year optimizing. Overall, the efforts cut IR’s cost per lead (CPL) nearly in half. Learn more. As a leading marketing software provider, HubSpot does a great job of promoting itself, but is always looking to uncover new audiences and customers. 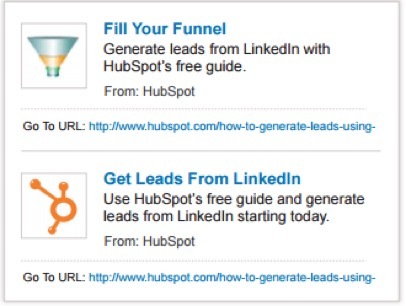 After getting mixed results from advertising on other social networks, HubSpot saw a 60 percent increase in click-through rate on LinkedIn by running brief, to-the-point Text Ads. “There’s no clutter on LinkedIn -- members are there to do business,” remarked Dan Slagen, head of paid marketing for HubSpot. Learn more. 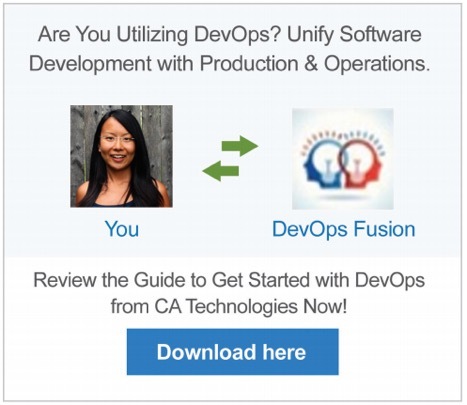 Enterprise software solutions company CA Technologies produced a whitepaper and wanted to get it out to the right people. Disappointed with the way their clicks were converting on other channels, they turned to LinkedIn with a personalized Dynamic Ads campaign that matched member profile images to brand assets. The promotions proved highly engaging, leading to a brisk increase in conversions and a 68 percent reduction in CPL. Learn more. 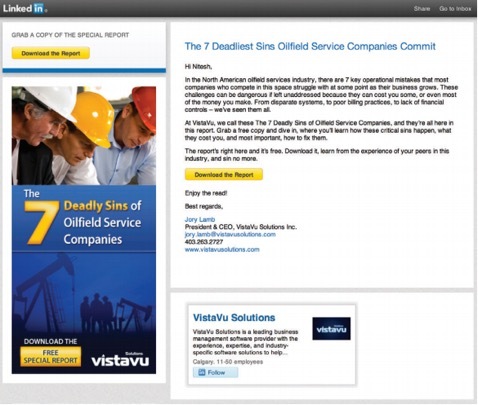 VistaVu Solutions is a business management software firm catering to a very specific business sector: oilfield services. With catchy content designed to grab the eyes of a clear-cut user category, VistaVu used Display Ads and Sponsored InMail to generate tremendous results. Nineteen of the 20 leads captured in the first week moved on to sales as qualified leads, while the campaign’s CPL checked in at one-fifth the company’s typical benchmark. Learn more. Enlisted by a client to connect with Chief Learning Officers and top HR execs within Fortune 500 companies, marketing agency Clever Zebo served Display Ads based on job function, seniority, and company size in order to reach this coveted audience, testing and optimizing for the best click-through rates possible. The efforts paid off as the campaign generated a strong 15 percent conversion rate and compiled copious quality leads. Learn more. When thought leadership is the goal, boosting the right content can elevate your profile significantly. Aspect, a customer service software provider, sought to further establish its credibility and capabilities in this area. By using Sponsored Content to amplify the reach of its informative whitepapers, infographics, and webinars, Aspect scored huge engagement, with a 290 percent increase in referral traffic and a 17 percent jump in Company Page follows. Learn more. Some companies lack clearly defined professional labels within their customer base. This is the case for Integrative Therapeutics, a manufacturer and distributor of nutritional supplements marketed to integrative medicine clinics across the country. The job titles for people who benefit from their products vary widely, so targeting by traditional means can be tricky. But by aggregating known titles and relevant skills, they developed the right audience and engaged them with a mix of Sponsored InMail, Sponsored Content, and Display Ads. Integrative Therapeutics set the stage for maximum impact with its featured eBook by first researching topics that were gaining most traction within the industry. As a result, the company grew its email database by more than 25 percent and achieved excellent click-through rates. Learn more. 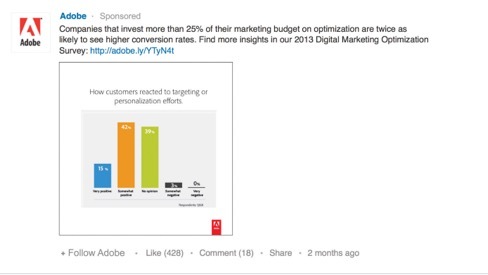 Feeling Inspired by These Examples of LinkedIn Ads? Maybe it’s time to create your own and crush it. The case studies above show how you can use the platform’s targeting capabilities, extensive engagement methods, and dynamic features to stand out and reach -- with pinpoint precision -- the most valuable audience possible. Take LinkedIn self-service ads for a spin.